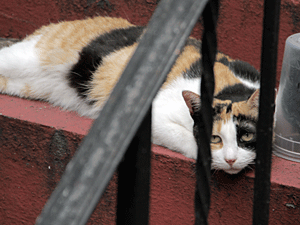 New York, NY – Monday, March 19, 2012 – The small colony of eight feral cats has not been fed for almost two weeks at historic St. James Church in lower Manhattan. Father Lino Gonsalves and Father Walter Tonelotto have locked out caretakers there in an effort to starve the cats off church property. The priests refuse to meet with the Mayor’s Alliance for NYC’s Animals to discuss any plan for cat care, though caretakers are willing to address any concerns the church may have for security or hygiene. Where will the cats be welcomed if even a church is throwing them out? The cats are all neutered and vaccinated, following the guidelines of Trap-Neuter-Return (TNR), the only proven effective and humane method for controlling feral cat populations. When contacted for comment by the New York Daily News, Father Gonsalves derided, “The cats will not be poisoned, but we don’t want the people to feed them on church property.” Since the church owns all property in the vicinity, does the Father imagine that starving them out is somehow less cruel? Eradication of the cats is clearly the church’s goal, if not by poison as once declared by the groundskeeper, then by starvation. Until now, St. James’ feral colony was a model TNR project for which the church could be credited with humane leadership by example. This recent public banishment of the cats sends a very cruel signal to others facing the decision of how to approach feral cat management. “We can only imagine what the Holy Father, who himself lovingly tended to his feral cat colonies, would think about this situation,” said Jane Hoffman, President of the Mayor’s Alliance for NYC’s Animals. She added, “As a Roman Catholic, I am saddened and appalled by this attack on eight of God’s little creatures.” The Holy Father, Pope Benedict XVI, is known to adore feral cats, and has defended their care on the grounds at the Vatican. The Mayor’s Alliance delivered a letter to H.E. Timothy Cardinal Dolan asking him to intervene on behalf of the animals and allow for their continued care and protection. They also asked him to end harassment of the caretakers. The church groundskeeper locked a cat caretaker inside the courtyard last week and called the police to report the caretaker as trespassing. The caretaker slipped out a side exit before police arrived, but she was shaken by the hostility of the confrontation. Those who wish to comment directly to St. James Church officials can e-mail Father Lino Gonsalves at sjc@stjosephnyc.org. (The Archdiocese of New York and the Vatican will be copied on your e-mail.) You may also call Father Lino Gonsalves of St. James Church at (212) 267-8376 or Joseph Zwilling, Communications Director for the Archdiocese of New York, at (212) 371-1011 x2997.